Have you ever had this weird feeling, that the parallel world really exist? What if the door to that forbidden place hides in your bookshelf? Your mother used to be a covert chronicle keeper - a guardian that supports the stable connection between both worlds. After the sudden attack of evil force, you are the only one, who can save her. Do you have what it takes to keep up with family tradition? 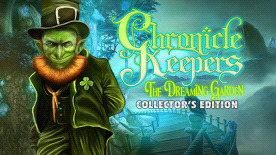 One book can change a life forever... Be brave enough to read the Chronicle Keepers: Dreaming Garden!